European Rally Championship frontrunner Craig Breen has been released from hospital and will be returning home after hurting his back during Rally Finland last weekend. 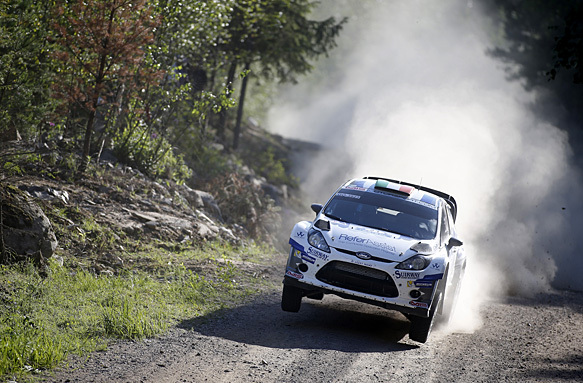 The Irishman entered the final day of the WRC event in ninth place overall, but his participation was curtailed at the end of the Ruuhimaki stage following a heavy landing over a big jump that injured his back. Breen climbed out of his Ford Fiesta at the finish and quickly summoned medical attention. "I tried to go flat out over the famous jumps and now I'm flat on my back," said Breen, who was initially treated by medical crews beside his car after the incident. He was later taken to a nearby hospital in Jyvaskyla for further checks, before being released on Monday morning to begin his recuperation at home in Ireland. Co-driver Scott Martin confirmed that doctors were encouraged that Breen was showing signs of less pain and also revealed that his driver would be wearing a protective back brace for the next few weeks. "He has got to be careful and he will be seeking the best specialist advice possible during his recovery," said Martin. "Fingers crossed he'll be fit for Barum [the next round of the European Rally Championship], which is the focus now as the title is still the main goal."